Add 20ml Vermouth, 30ml Gin, 15ml Pistachio Syrup and 20ml lemon juice to a shaker. Crack an egg and separate the whites into the shaker and put the yolk into a shot glass. Give the ingredients in the shaker a quick dry shake, and then add ice and shake again. Single strain into your cocktail glass, add a dash of soda and garnish with a mint leaf. In the shot glass, add a touch of Tabasco to your egg yolk chaser. Mon Cointreau Fizz - Et voilà ! 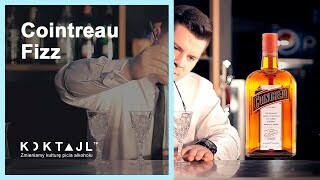 Simple Cocktails - How to make a Cointreau Fizz.